If you haven't heard of the 7 Habits of Happy Kids, you need to read this! Based on Stephen Covey's The 7 Habits of Highly Effective People, the 7 Habits of Happy Kids are habits that you can teach your students to help them develop into responsible leaders and learners. The school that I teach at is considered a "Leader in Me Lighthouse School", which means that we implement the 7 Habits of Happy Kids and other leadership tools in our school. Be Proactive- Students take initiative to get their work done instead of you having to remind them. They also choose their moods and attitudes. Begin with the End in Mind- Students have a plan for different things. Examples include setting goals for themselves and planning ahead when working on a project. Put First Things First- Students make their classroom work a priority before doing a "quiet choice" or other option. They can also practice this habit at home by doing their homework first before playing. Think Win-Win- Students work together to make sure that problems are solved with a win-win solution. A Win-Win is a compromise where everyone feels that they've won. Synergize- Students work together and use their strengths to make the group the best that it can be. Sharpen the Saw- Students take care of themselves by having fun, execising their mind and body, and spending time with friends and family. Once students understand the meaning of the habits, then it's time to have them start demonstrating the habits at school and at home. You will really notice a difference in your students and classroom culture when they begin to use these in their own lives! It is so wonderful to see them develop into confident, responsible leaders. 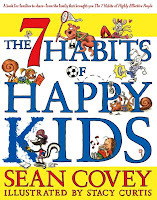 If you would like to read more about the 7 Habits of Happy Kids or the Leader in Me program, click here. Below, I've also shared a freebie for using the 7 Habits in your classroom. This freebie is a set of awards that you can use when you "catch" one of your students demonstrating the 7 Habits. The kids LOVE to get these and the parents also enjoy seeing them come home. Just click on the picture to download the award certificates for free! What are some ways that you incorporate leadership into your classroom? I just awarded you the Lovely Blog Award. Sorry if you already have it but thought I would let you know that I love your blog!! Stop by my blog! My school is also a "Leader in Me" school and we are working towards "Lighthouse" status. I love the tree on your class door! I'm always excited to see how other teachers are implementing the 7 Habits in their classrooms. My book arrived from Amazon today! So excited to share this with my 3rd graders in about a month! Hi! I was hoping to grab your certificates (Found your blog through Pintrest! ), but noticed they aren't on your TPT any longer. I am actually noticing this about many of the 7 habits resources I have been looking for/at; we're you required to remove them? Just curious! I was just wondering the same thing Rhiannon DeBaylo. Me too! I can't locate these certificates either! I can not locate the certificates.